The Type 94 tankette (Japanese: 九四式軽装甲車, Kyūyon-shiki keisōkōsha, literally "94 type light armored car", also known as TK that is abbreviation of "Tokushu Keninsha" that means special tractor was a tankette used by the Imperial Japanese Army in the Second Sino-Japanese War, at Nomonhan against the Soviet Union, and in World War II. Although tankettes were often used as ammunition tractors, and general infantry support, they were designed for reconnaissance, and not for direct combat. The lightweight Type 94 proved effective in China as the Chinese National Revolutionary Army had only three tank battalions to oppose them, and those tank battalions were equipped only with some British export models and Italian CV-33 tankettes. As with nearly all tankettes built in the 1920s and 1930s, they had thin armor that could be penetrated by .50 caliber machine gun fire at 600 yards range. 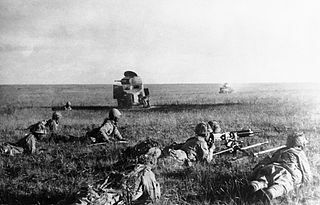 The Mongolian People's Army or Mongolian People's Revolutionary Army was an institution of the Mongolian People's Revolutionary Party constituting as the armed forces of the Mongolian People's Republic. The Type 95 Ha-Gō was a light tank used by the Empire of Japan during the Second Sino-Japanese War, at Nomonhan against the Soviet Union, and in the Second World War. It proved sufficient against infantry but, like the American M3 Stuart light tank, was not designed to combat other tanks. Approximately 2,300 were produced, making it the most numerous Japanese armoured fighting vehicle of the Second World War.